Vincentio, the Duke of Vienna, is disgusted by the chaos in his city due to lack of a good government, and announces his withdrawal from public life. Instead, he appoints his deputy, the puritanical Angelo, to be in charge. Angelo, who is actually repressed and troubled, takes his position seriously, and begins to ruthlessly bring harsh justice. Among his acts of justice, he condemns Claudio to death, who impregnating the woman he is betrothed to, Juliet. udio’s virginal sister Isabella, a novice nun, is begged by Claudio to intervene with Angelo's decision. But when Angelo meets Isabella, he becomes intoxicated with her intellect and beauty. 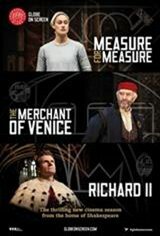 In this story of secret identities and deception, audiences are invited to unravel the layers of intrigue carefully crafted by a superb cast and the directorial prowess of Dromgoole in his final production for the Globe Theatre.